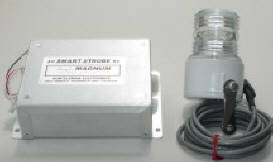 SINGLE MAGNUM SMART STROBE | Kuntzleman Electronics, Inc. The SINGLE MAGNUM SMART STROBE Driver is a state of the art single strobe light system. There is not another system on the market like this one. 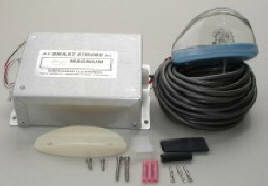 It will operate on 10 to 80 volts of AC or DC input power. It can be powered directly from the engine lighting coil (AC) or from a battery (DC) without any change in brightness or its double wink flash pattern at a 74 per min. rate There are NO options to change and NO special equipment needed. This model is a favorite for king post installations and with the PPC flyers. It is also available with either the standard STREAMLINE HEAD or the COMBO STREAMLINE WHITE HEAD. Both are popular for tail mounting. The globe style is a Fresnel lens. The head comes with 6’ of wire and plug attached. Includes 25’ of 3 conductor wire, plug, pins and mounting hardware (includes adaptor plate for curved surface mounting if needed). 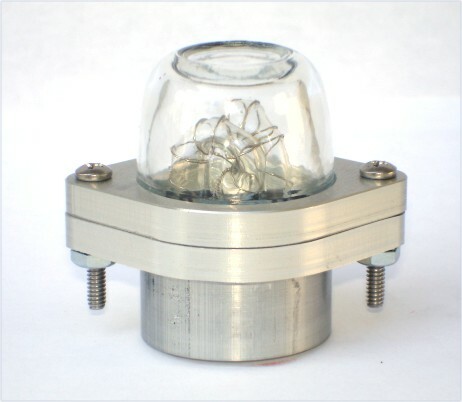 Includes 25′ of wire and mounting hardware. SS with STREAMLINE COMBO Head, White Led & Strobe Combination. Includes 25’ of 5 conductor shielded wire, plug, pins and mounting hardware (includes adaptor plate for curved surface mounting if needed). SS with ROUND TAILLIGHT COMBO Head, White Led & Strobe Combination.